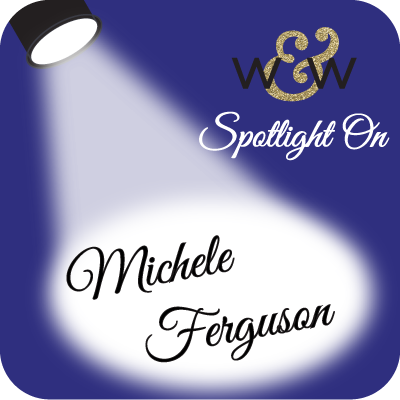 We are thrilled to have Michele Ferguson back with us for another incredible post that will inspire you to make beautiful projects for your friends! If you missed learning more about Michele and seeing her first post that will stun you with their loveliness CLICK HERE. Hello again! I'm back this week for a few more of my favorite ways to use Winnie & Walter products ... so many ways, one day just wouldn't do! I seem to design "in the round"! Does that make sense to any of you? In other words, when an idea strikes, I set about putting it to paper ... sometimes, while creating the first, another design will come about - like with the positive and negative idea from last week. Enter exhibit #1: Yes, black IS one of my favorite colors! the die around, and partial die-cutting! in the "Big, Bold and Happy" set. and The Big, the Bold and Extras - home, and the beautiful banner. You had to know I planned ahead while cutting that hi - right? In Bloom: Lola's Bouquet has a very, very special place in my heart. My final card is my way to say 'thank you' to Winnie & Walter for inviting me to share my creations using their fabulous products. Also for their generous hearts, and continued support of all of us, and our love of paper-crafting. I am pretty new to this blogging world, so I can't help but feel ever so special to be among those of you Winnie and Walter have shone their ever-lovin' spot-light on! Another one of Lola's Blooms - this time in orange - another favorite color, and a remake of this card - I couldn't wait to make that cool square vase! 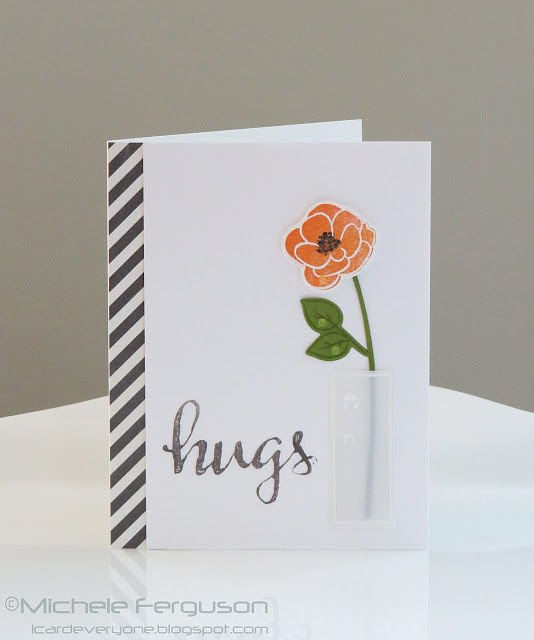 Hugs provided by The Big, the Bold and Friends Cutaways and Stamps. LOve that brilliant hand-written font! Thanks for hanging out with me today, and thanks always for all the love and sweet comments from you, my card-loving, card-making, fabulous friends! 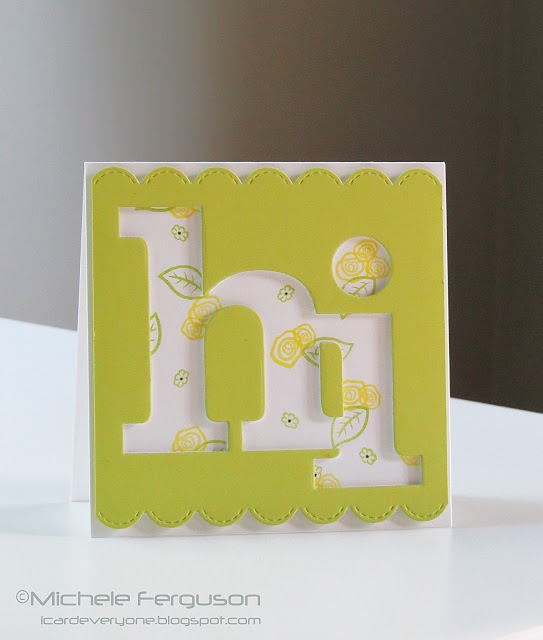 *Embossing folders, patterned paper, and embellishments are from my stash and not W&W products. Excellent choice for a spotlight! 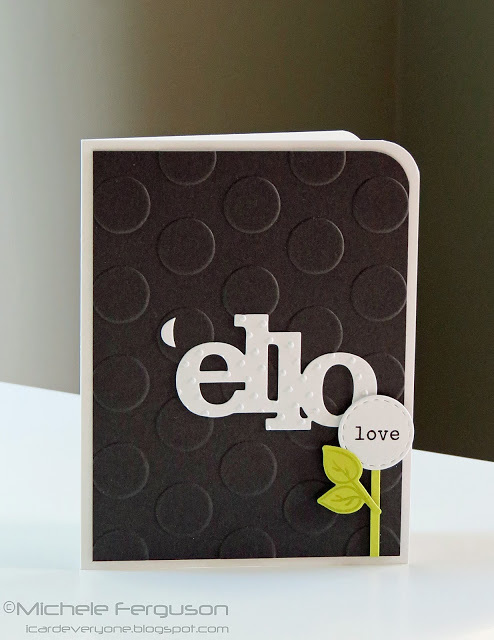 Michele is an extraordinary designer and so happy to see her gorgeous cards featured here! Your black-and-white 'ello, your polka-dot and pineapple (how cute are they!) Hi, your yellow roses Hi and your single rose Hugs...I'm swooning over all four! CAS-iclicious and ever so stunning. Tracey's right: you are a designer extraordinaire and I'm thrilled that Julie and Shay brought you and your amazing creativity to W&W! If I had that big "hi" die, I'd be casing up a storm! Guess someone needs to add it to her collection *grin*! Truly awesome, Michele...truly! These are fabulous!!! Amazing work you've shared! I always enjoy seeing how Michele 'plays with' her Winnie & Walter goodies, and once again she has out-done herself! Gorgeous color combos and pairing of her stamps and dies...WOW! Love these, so creative and inspiring!! Oh WOW!! This cards ROCK!!! Love, love, love! Loved seeing more of Michele's fabulous work here today! The first card is extremely cute!! So happy to see the spotlight on Michele! Love her work and how she made your stamps and dies shine! Well done, Michele! These are just amazing!!! Love them all!! Love all of Michele's fabulous cards - and yes, I appreciate her sense of humour, which shines through her cards sometimes too. ABSOLUTELY FABULOUS cards Michele - LOVE your STYLE!!! So thrilled to see you in the spotlight again, Michele! So well deserved!! Love every one of your designs-- every one is just awesome. Your creativity never ceases to amaze me! So many wonderful cards I can't get enough of them. You outdid yourself, Michele. Fantastic embossing, Michele. You just reminded me that I should emboss more often. Beautiful cards! Totally blown me away Michele, these are all so beautiful and stylish. The simple designs with perfect stamp placement and I love that little square vase. Your ideas are always new and original and I learn something from every card you do. So proud of you my friend!!!!!! I am super impressed by and in love with EVERY. SINGLE. ONE. OF. THESE. CARDS!!!! Love Michele's work and her style is just so fresh and original - she really did W & W proud!! !